I don't think I'll ever get a tattoo, but if I did it would be cat related. 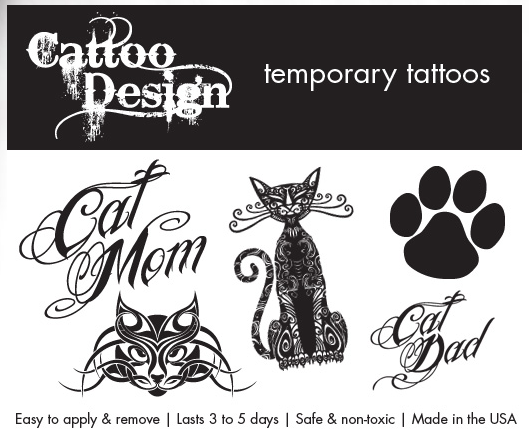 If you're commitment-phobic like me, Cattoo Design founder Kate Benjamin has just released a line of cat-themed temporary tattoos so you can get the look, without being inked for life (3 to 5 days is more like it). Individual designs like paw prints, tribal cats, and my favs, "Cat Mom" and "Cat Dad" are available for $5 each (for two sheets), or you can purchase the whole set (seen above) for $20. Wow, they look like fun!! !